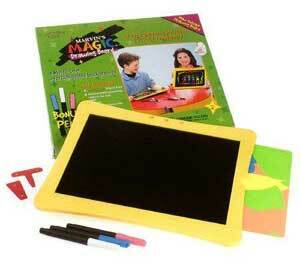 With Marvin’s Magic Deluxe Drawing Board, your child can magically create beautiful pictures and effects with the new neon, sunshine, and glow-in-the-dark interchangeable backgrounds. The T-shape stylus creates longer, wide pictures, while the new V-shape stylus lets your child design smaller, more detailed shapes. Your child can also create cool, 3-D effects with our new neon pastel over-writers. They enhance any picture and best of all, the ink wipes off with ease.